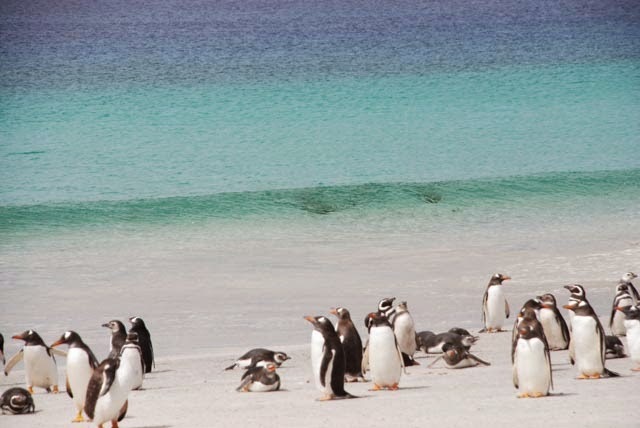 It is impossible to meet the penguins who spend the summer on the Falkland Islands without being anthropomorphic about them. They are all such characters, displaying human-like behaviour and emotions, and all four species are very different. It is just so fortunate that during the whole of the Falklands conflict, they were far away and at sea. It is also very fortunate that being birds, penguins are light in weight, and are in no danger from land mines. 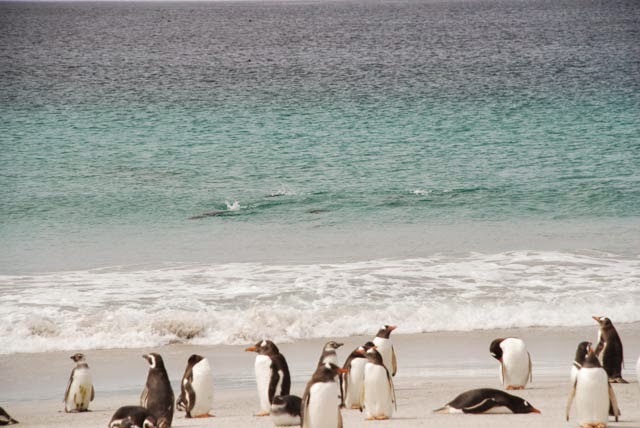 When my wife and I visited the Falkland Islands, we first met penguins at Gipsy Cove, not far from Stanley. Since the conflict, it has not been possible to enter Gipsy Cove because of the danger of mines. However, a fenced footpath passes above the Cove that has regular posts warning of the danger of the mines (much of this has now been cleared I gather). 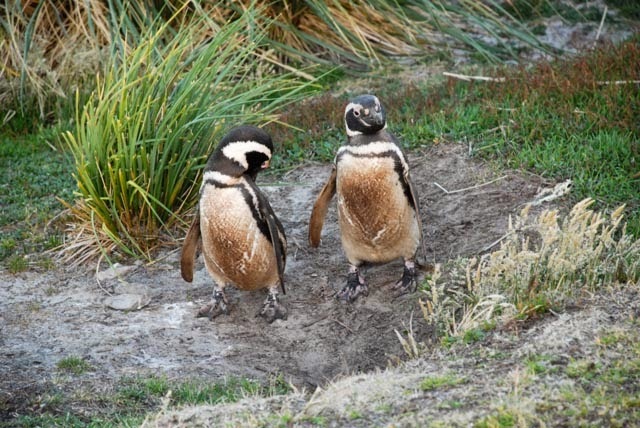 The path runs straight through a Magellanic Penguin colony, and far from the fence being a protection from humans, several penguins nest within two or three feet of the path. We were introduced to one very special character who is affectionately known as Harold. He has been coming back to the same burrow for several years. He stands proudly at the entrance, perhaps three feet from his human admirers, and periodically announces his presence, and probable importance, with a racket that seems impossible to be produced from such a little fellow. He puts his head back, his flippers out and brays just like a donkey (a close relative of Magellanic Penguins that lives in South Africa is called the Jackass Penguin). – hope no-one will be cross! All around the colony penguins go about their business totally oblivious of any humans in the area. 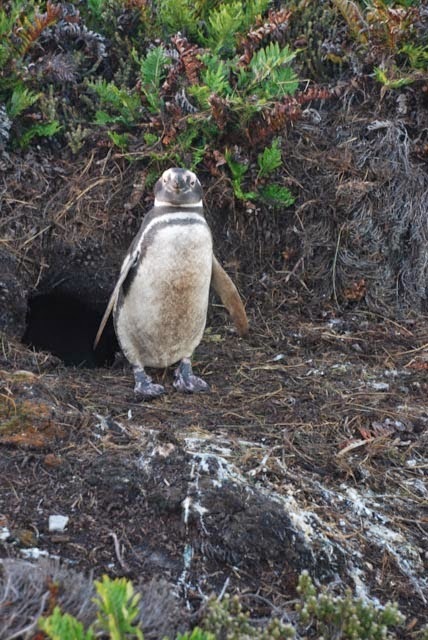 Further out towards a headland, in amongst hummocks of tussac grass and much less affected by humans, there is another Magellanic Penguin colony. These birds, which appear a little larger than those at Gipsy Cove for some reason, are much more timid. Wait for me….Wait for me! 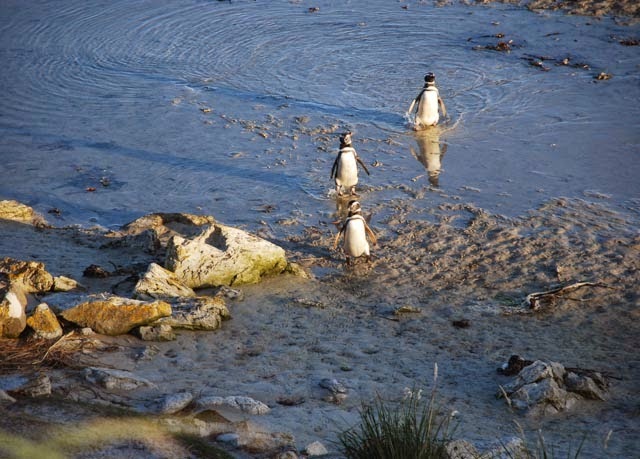 For penguin enthusiasts, a visit to Volunteer Point is an absolute must. There is however a problem. Getting to the Point involves crossing several miles of treacherous bog. This can only be attempted in a Landrover, and by someone who knows precisely where he is going, and what he is up to. The Landrover in question is decorated with antlers, and painted across the front above the windscreen are the words Crocodile Dundee. Three species of penguin live at Volunteer Point amongst the sheep, which seem quite incongruous, and these are; King Penguins in their only Falklands colony, Gentoo and Magellanic Penguins. 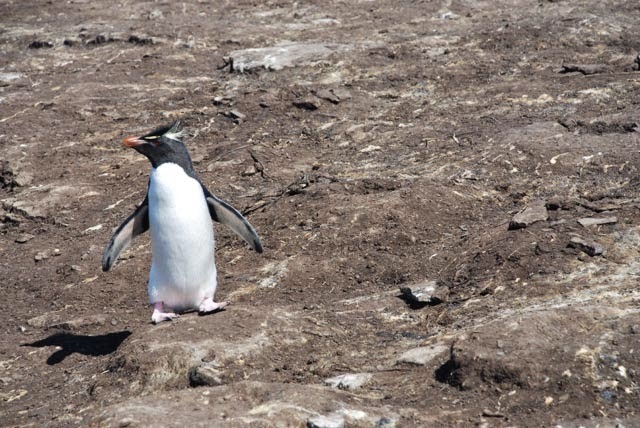 When we visited, we first went to the Gentoo colony which is nearest to the Landrover parking area. The colony consists of several hundred individuals all going about their business, and chatting to one another. If visitors do not have respect for the birds, and move around noisily and at speed, the whole colony may panic and this is something that should be avoided at all costs. 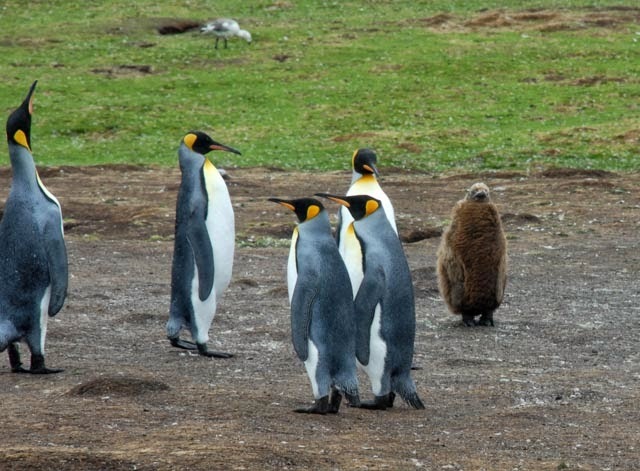 However, if a visitor sits down quietly, it is not long before a little ring of about ten penguins will gather in a semi circle, and start discussing you intently. 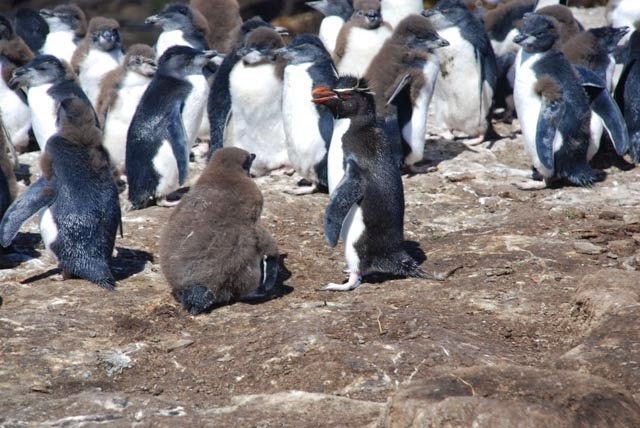 Amongst the group are invariably one or two Gentoo chicks, and these have a very special charm. 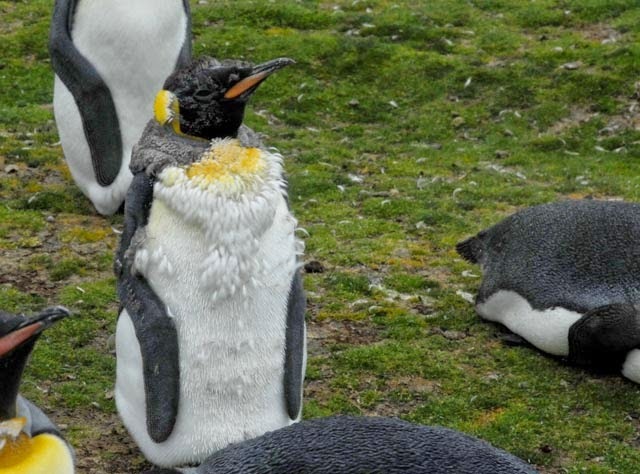 Gentoos have developed a method of keeping their chicks healthy. Before giving them food, they run away from the chick forcing it to sprint after its lunch and get much needed exercise. 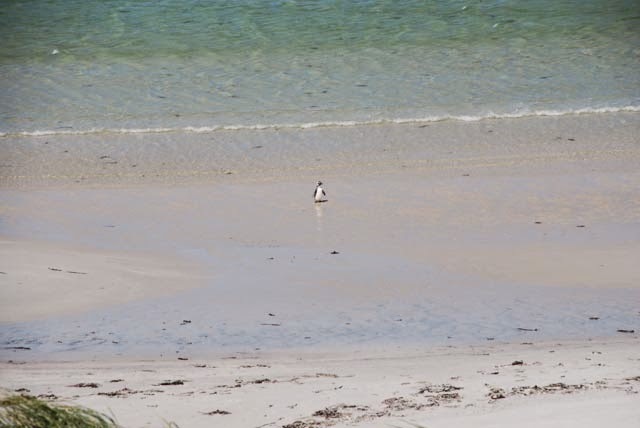 The Magellanic Penguins at Volunteer point are scattered all over the site. 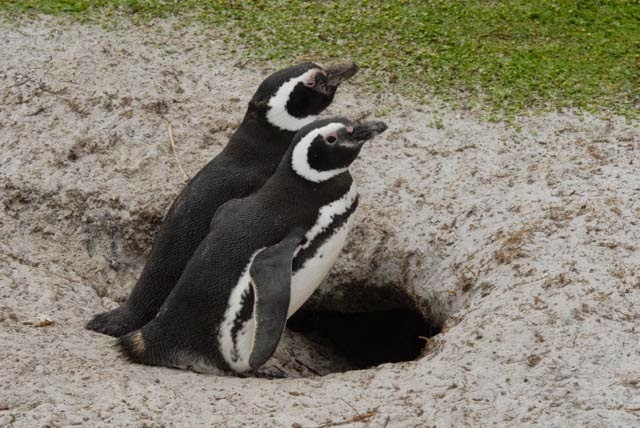 Magellanic Penguins do not form tight colonies like the other species. They also nest in burrows unlike any of the others. Sadly, they also suffer from fleas, which like the warmth of the burrows. 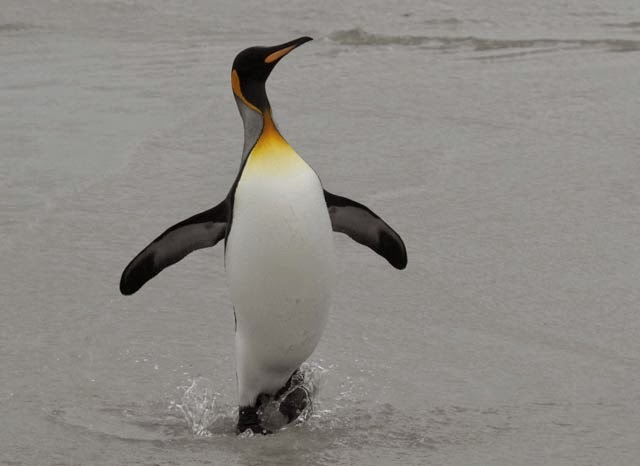 In spite of the charms of the Gentoo colony, it is the King Penguins that most visitors come especially to see. They are a tall and elegant species that rarely move in haste. 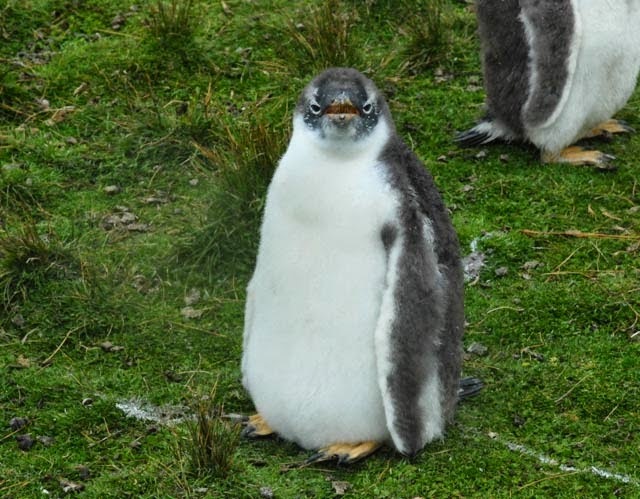 Although very beautiful, they do not have the anthropomorphic charm that the other three Falkland Island penguins have, and move with care and deliberation. Surrounding the colony, there is fencing designed to separate humans from birds. The penguins it seems, cannot read and take not a blind piece of notice of the areas where they are supposed to be. So long as visitors respect the residents, they can co-exist with no problems whatsoever. In one area of the colony, and perhaps a little away from the rest, was a group of males, each with a swelling between his feet. From time to time, a scrawny, featherless, grey object would appear between the feet. 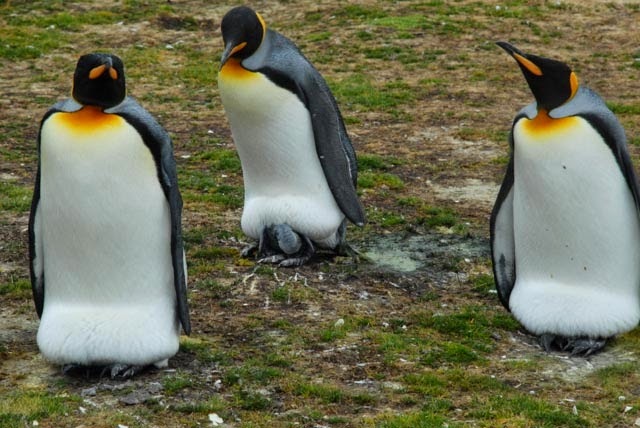 These were the King Penguin chicks, and I am afraid they lack any of the charm displayed by the hero of the film Happy Feet (who was an Emperor Penguin). The fathers look after their charges with an amazing charm and tenderness that is a delight to see. During our visit, we only saw one chick in full, fluffy brown plumage looking over fed and out of proportion. There were, however, more mature chicks that were just discarding their first plumage, and these totally lacked the charm and elegance of their parents. 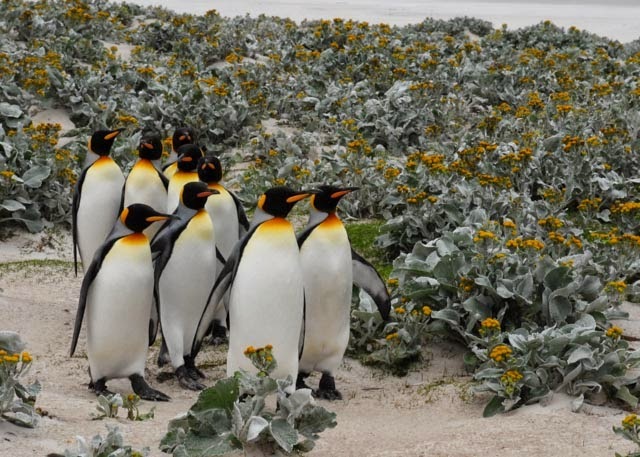 Looking very human, groups of King Penguins could be seen taking an afternoon constitution through vegetation consisting of the ragwort relative Sea Cabbage. 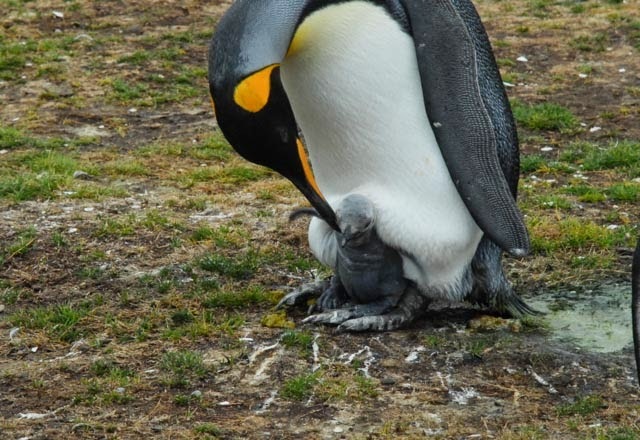 We did witness a sad drama when a sea lion lumbered over the sand, and managed to catch a King Penguin which it took back to the sea, and drowned. 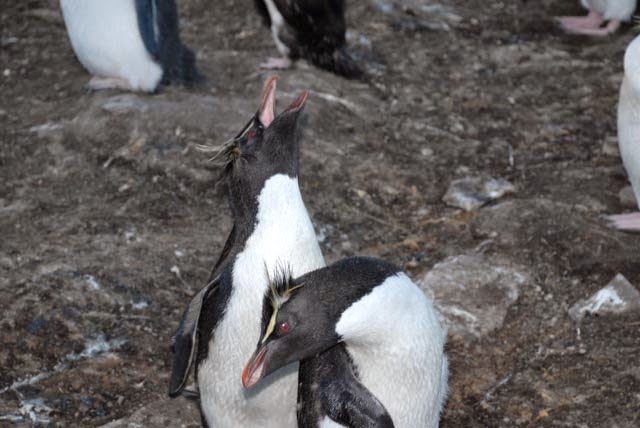 Our third and greatest experience with penguins took place on Bleaker Island. Here we stayed in a very comfortable cabin supplied by the owner who is a farmer, and his wife. Our first encounter with penguins on Bleaker Island involved passing through a massive colony of King Cormorants. 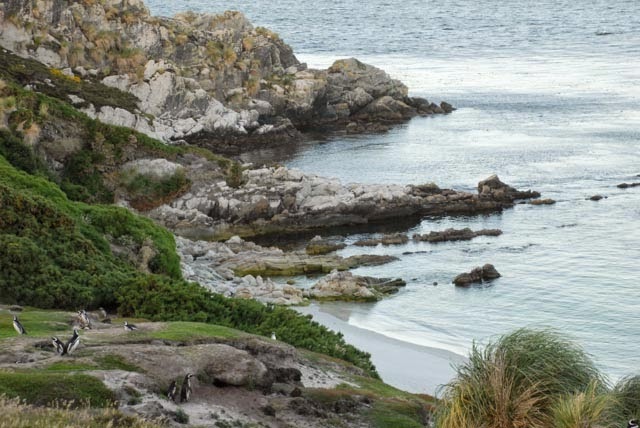 On the other side of the cormorants to the settlement, and on the cliff tops in amongst tussac grass hummocks is a colony of Rockhopper Penguins. 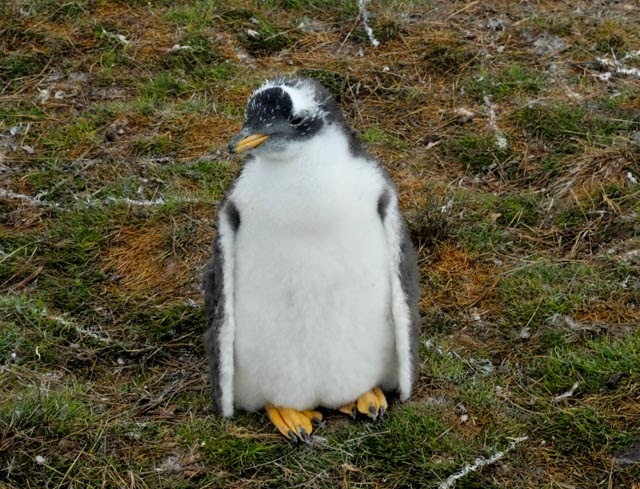 They are the smallest Falklands species, but what feisty little creatures they are. 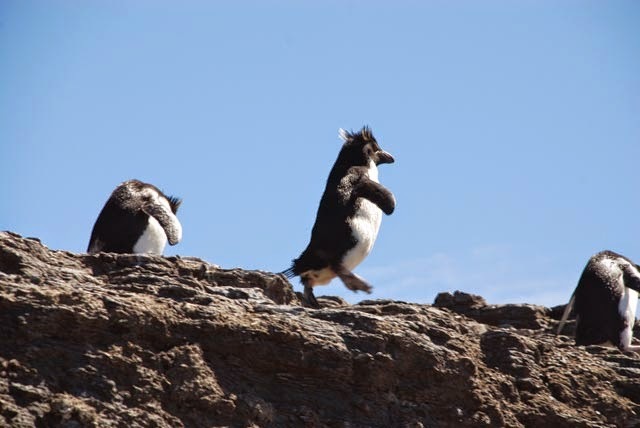 As their name suggests, they dash speedily about the cliff tops, hopping from one rock to another. Rockhoppers are also noisy little creatures, and seem forever to be having intense arguments. They will argue at the tops of their voices putting their heads back, then one will pick up a tiny twig, place it at the other’s feet, and immediately start arguing all over again. During the day, many members of the colony will be at sea fishing. When this occurs, the chicks are herded into a tight colony, a sort of crèche where one or two adults will be responsible for them. 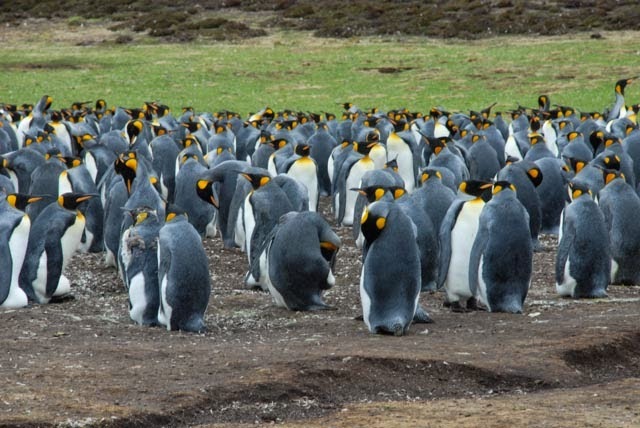 Humans approaching a crèche cause no alarm, however if their greatest fear, a Falkland Skua flies over, they squash themselves into a tight huddle. Some distance from the Rockies, and towards the north end of the island, there is a very large colony of Gentoo Penguins. 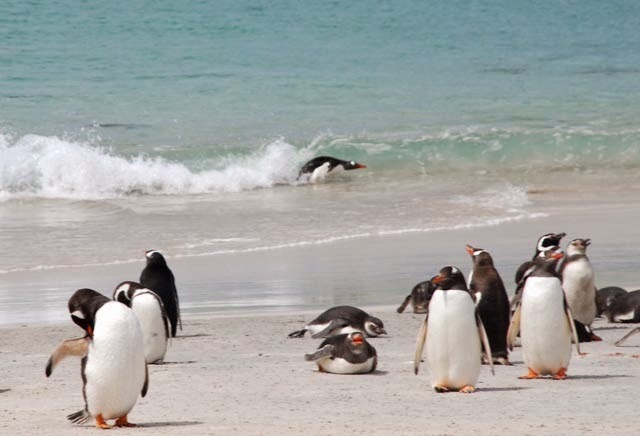 They often congregate on the beach, perhaps a hundred yards from the edge of the colony, where they stand about, often in company with a few Magellanic Penguins. From time to time, they will take it into their heads to go for a swim. On the way back, they lurk in the water where they wait for just the right wave in which to surf into the shore. My wife waited for hours to get a photograph of a bird as it was actually carried in on a wave, but never achieved what she wanted. 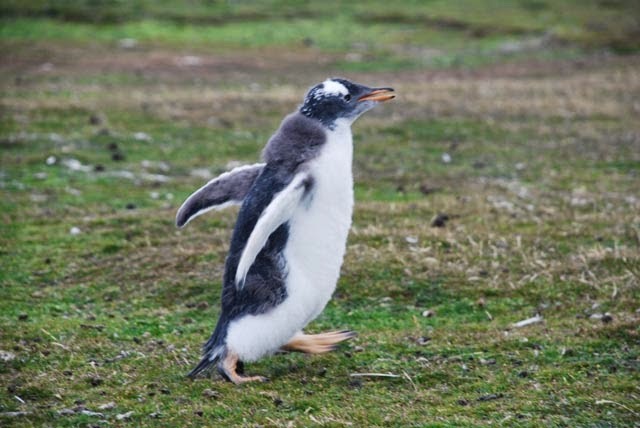 A Gentoo Penguin enjoying the moment of being carried in the surf to the shore is such a fleeting event. However, there is a great joy in the event, and triumphant attitude on the beach as the surfer jumps up from the water at the end of the ride with flippers outstretched as if seeking adulation. 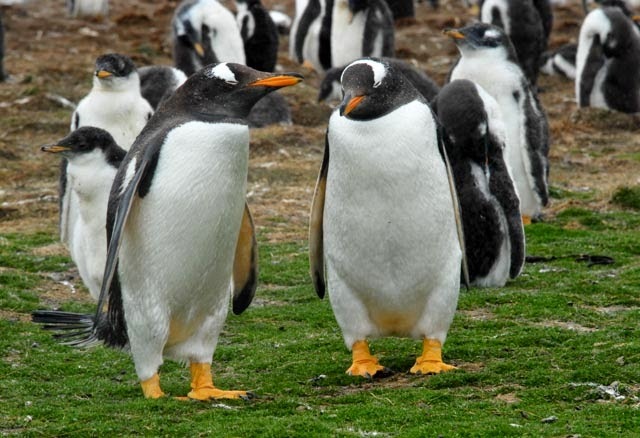 The four species of penguin described above are the main species, however there are a small number of Macaroni Penguins, which we did not see, that breed. These look like larger versions of the Rockhoppers. Very occasionally species such as Chinstrap Penguins make it to the Falklands as vagrants from the south. Naturalists marvel at the fearless nature of the birds and animals on the Galapagos Islands. 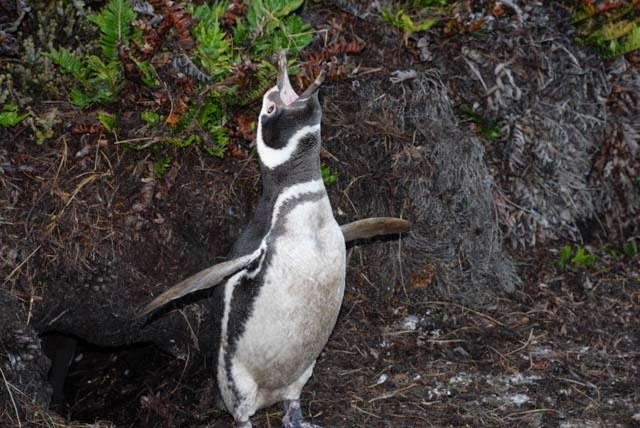 However, exactly the same fearlessness can be seen, and enjoyed, in the bird populations of the Falkland Islands. This is especially true of the penguins and we must all hope that this mutual respect between bird and mankind survives on the Falkland Islands for many years to come.